I. Foundations of Personal Information Management: Introduction: A study and a practice; A personal space of information; A framework for understanding PIM. II. Activities of Personal Information Management: Finding and re-finding: From need to information; Keeping and organizing: From information to need; Maintaining personal information for now and for later; Managing privacy and the flow of information; Measuring and evaluating a practice of PIM: Is it working? ; Making sense of things. III: Solutions for PIM: Email goes away? ; Search gets personal; PIM on the go; PIM on the Web; Bringing the pieces together. IV: Finding our way into the future. Appendix: Glossary of terms. 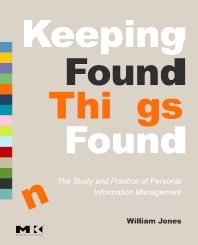 Keeping Found Things Found: The Study and Practice of Personal Information Management is the first comprehensive book on new 'favorite child' of R&D at Microsoft and elsewhere, personal information management (PIM). It provides a comprehensive overview of PIM as both a study and a practice of the activities people do, and need to be doing, so that information can work for them in their daily lives. R&D professionals in HCI, data mining and data management, information retrieval, and related areas, plus developers of tools and software that include PIM solutions. William Jones is a research associate professor at the University of Washington, Seattle, where he manages the Keeping Found Things Found project. Dr. Jones contributed chapters on personal information management (PIM) to the Annual Review of Information Science and Technology, the Handbook of Applied Cognition, and the Encyclopedia of Library and Information Science. He has presented numerous tutorials and courses on PIM, co-edited a book on PIM, and organized two PIM workshops, including an invitational sponsored by the National Science Foundation. Dr. Jones has published articles on basic research in cognitive psychology and more applied research in PIM, information retrieval, and human–computer interaction. Dr. Jones holds several patents relating to search and PIM. He received his doctorate in cognitive psychology from Carnegie-Mellon University.